Despite the cancellation of headlining band Black Dice, TT the Bear’s was packed this past Monday as fans squeezed in to hear a night of art-rock headlined by the Animal Collective. Lamentably lacking their typical animal costumes, the four-piece noise-pop band played an incredible 80-minute set that audience members clapped and cheered until it was followed up by a ten minute encore. After completing their set, the band timidly expressed a touchingly heartfelt thanks to the crowd. The Collective played a few songs from Sung Tongs, their newest album, but for the most part stuck to more long-form experimental pieces, consisting of their trademark mixture of lullabies and campfire songs with organic atmospheric noise, featuring child-like, heavily modulated and treated vocals, melodically moody guitars, and drums equally influenced by tribal and electronic music. The stylistic content songs at the show varied greatly, with some portions having more structured lyrics, to others being more noisy and nebulous, with heavily filtered and treated vocal arrangements strikingly beautiful and harmonic. The set’s longer movements were broken up by the amazing drum sections, which built up regular rhythms with a single beat in each that came just barely before expected, keeping the listeners on edge. These were interspersed with loud crashing breakdowns that gave an animalistacally cathartic element to the usually calm and soothing sonic euphoria. During these forceful interludes, the entire band would scream and howl while jumping around and pounding the stage—obviously designed to make more sense while wearing animal costumes, but effective nonetheless. Overall, the Collective produced a triumphant, celebratory sound that produced a ritualistic exhilaration that invited the listener back to the uncertainty and wonder of a child’s exploration of all that is new and beautiful in the world. The four-piece from Baltimore, Maryland all went to high school together and are now based out of New York. Each member has a different persona: Noah Lennox is “Panda Bear” and has his own side project on Animal Collective’s label, David Portner plays the role of “Avey Tare,” Brian Weitz, who wears a miner’s light over the effects box and minidisc players he operates, is “The Geologist,” and Conrad Deaken is (somewhat less creatively) “The Deaken,” an elusive figure. On sale exclusively at the show were Black Dice/Animal Collective split LPs. The $10 records, which sold out minutes after the show’s conclusion, went for prices nearing $80 on eBay at the beginning of the tour. Before the Animal Collective took the stage, the NYC-based space-pop quartet Gang Gang Dance played. The band was a last minute replacement after Black Dice had to duck out due to family illness. Described by scenester Joey Rhyu as “No Neck Blues Band meets Black Dice,” the band played a melodically spacey set that was at once epic and amorphous while still being very together and incisive. Lead singer Liz Bougatsos provided heavily reverbed ethereal vocals that brought to mind a number of folk and traditional influences. She broke these aery melodies up with heavy breathing sounds and bird-like screeching and scatting. The synthesizer/keyboardist produced old-school laser and space sounds while also beating a rhythm on an electronic drum pad, creating a tightly-controlled and intricate duet with the drummer, whose face was contorted as he wove a precise drum beat throughout the pieces that they played. The guitarist generated the most diverse array of sounds, as his many effects pedals churned out the sounds of tinkling glass and resonating pan pipes, along with more traditional distorted effects. 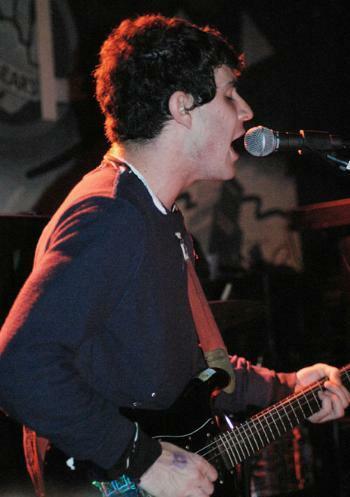 Despite technical difficulties with the lead singer’s microphone, the group produced a compelling and lightly danceable (or at least swayable) set which made use of the many sound effects at its disposal to create a lunar landscape of swells of sound that rose in complexity and volume before regularly breaking down into a chaos of arrhythmic percussive noise and screaming. Starting the show was Charlestown-based Sunburned Hand of the Man, an improvisational experimental acoustic-noise group comprised of ten members playing an impressive array of instruments. After announcing to the crowd, “We’re the Black Dice!,” the band members, who slowly crowded onto the stage in waves, and took turns exchanging domain over four or five guitars, a number of tambourines and rattles, a trumpet, two saxophones, a number of keyboards, a bullhorn, a stage full of pedals, cords, and oscillators, various noisemakers, and the emblematic drum kit with the outline of a hand painted on the bass drum. One band member appeared to be wearing wind chimes in her hat. The long, sprawling set comprised of two movements, the first 17 minutes and the second 28 minutes. The result was a sprawling, heavily-reverbed dreamscape that alternated from sounding atmospherically surreal, virtuosically psychedelic, and vaguely rockish. The band indulged in a number of bizarre antics: one band member ascended the stage wearing a grotesquely creepy horse mask, carrying a skeleton that wore a Sunburned Hand of the Man t-shirt; at one point, one of the members who was taking turns playing the drums swung a noose around like a lasso, attempting to rope other band members (but only succeeded in catching microphone stands); the skeleton was thrown out into the audience, where it crowds-surfed for many minutes before coming to its final rest; another band member donned a black executioner’s mask, wrapped the noose around his neck, and feigned death by hanging after throwing the rope over a ventilation pipe. In between the spectacle, the audience started intently at the hunched-over performers on the stage, trying to derive some sort of pattern from the seemingly random and spastic improvisations. They may have found nothing, but at the end of the night of incredible noise-pop, the elated fans poured out of the club into the freezing rain, wishing they could stay for the warmth of just one more campfire song.